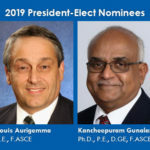 The ASCE officers election opens today, May 1, with votes accepted through 11:59 p.m. ET, June 1. Members at the grade of Associate and above in good standing as of April 1 will be eligible to vote via online balloting. Eligible voting members will receive voting information by email on May 1. Use your member login to cast your ballot. 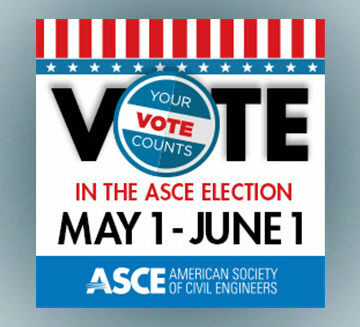 Paper ballots are available upon request; email Patty Montgomery at pmontgomery@asce.org. 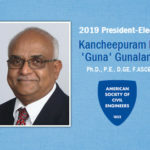 For more information on the election, including the complete ballot, visit asce.org/elections. They recently sat down with ASCE to record their responses to questions posed by ASCE members. What is the greatest challenge facing the civil engineering profession in the next 50 years, and what should ASCE do now to address that challenge? 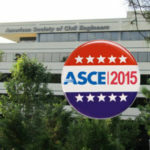 What would you tell a student or younger engineer about the value of ASCE membership? What specific things should ASCE do to promote innovation in professional practice?